Our long-term vision is to progress towards a stage where we have all the capabilities of manned missions to Mars. To keep progressing towards that long-term goal, we need to set smaller goals and timelines for achieving them. So, we figured that a mission to send a rover to Mars will be a good “first-step”. Currently, the Martian rovers that are operating on Mars are handled by Jet Propulsion Laboratory (JPL) which is a joint setup between NASA and The California Institute of Technology. So the next important question is “What are the capabilities and functions of the rover?” The answer lies in the overall scheme for a future manned mission to Mars. Currently, there are many researchers studying minimalistic architectures for Human Journeys to Mars. Since there are lots of variables involved which include international support, geopolitical conditions, technological advancement in the coming years and so on, we are studying the various architectures proposed and looking to build a proposal from different perspectives. So far, we like the recent architecture scheme developed by JPL (http://online.liebertpub.com/doi/pdf/10.1089/space.2015.0018). The stages of MarsPolar project are partially based on Mars Direct, NASA's and other architectures with changes that are based on current available technologies and needs. The second Mars stage of the "MarsPolar" architecture works as follows: In an early mission opportunity, a rocket vehicle will launch with a substantial upper stage lifts off the spaceport and takes a Mars Transfer Vehicle to LEO with cargo payload. After month from arriving of this first MTV's stage to LEO, the second stage with fuel tanks up to 40 tons and the additional engine will be launched to LEO and docked to the first stage. When the transportation spacecraft will arrive to the orbit of Mars, the lander will aerobrake into orbit around Mars and then lands with support of parachute or skycrane-like system. As soon as it landed, the truck is remotely driven a few hundred meters away from the lander. Then remotely controlled it will be deploy the solar arrays and four inflatable parts of the habitat. Then the life support systems and the water extractor will be turned on, so the breathable atmosphere will be ready till the second ship with the crew will arrive to Mars. In an early mission opportunity, a rocket vehicle will launch with a substantial upper stage lifts off the spaceport and takes a Mars Transportation Vehicle to LEO with a crew of 4-6 astronauts and additional cargo payload. The first crew will spend a short term (from one week to one month) on orbit till the second launch with the additional booster unit/propellant tank. For this time they will be able to make all preparations and tests for the transit to the Red Planet. Concept of the spaceship, that will be used for carrying the settlers and the hardware for constructing human colony to Mars. It is projected that the MTV will consist of two main stages, which will dock on the LEO before the start. 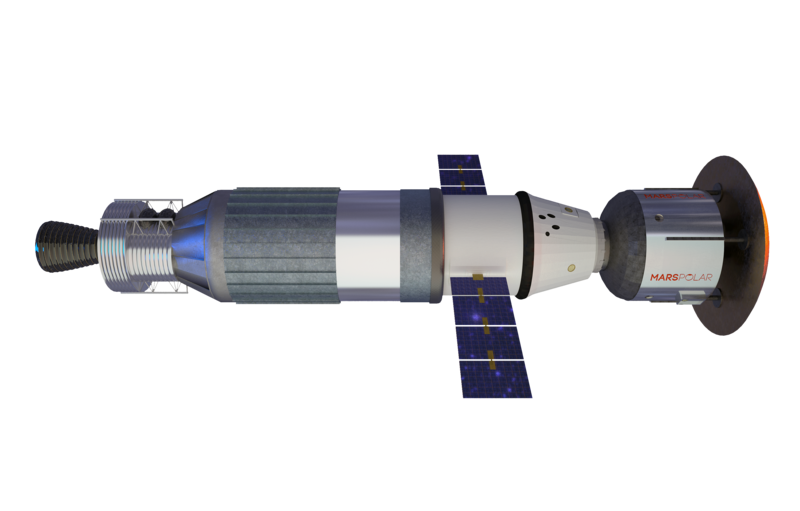 First stage fill consist of Crew capsule, habitation module and shield for aerobraking. Second Stage - is an additional booster with up to 40 metric tons of liquid propellant.